When Odile de Lannoy came to our house for the first time – she had only met me once, years before, and then only for minutes – but she came bearing the perfect present: a family recipe, handwritten in neat, straight-as-an-arrow script on a long sheet of paper. Had she brought me kilos of chocolate, I couldn’t have been happier. Odile prefaced her gift by saying, “I hope you won’t think the recipes is too simple,” then added, “but these are the kinds of cakes that I make for my family.” Odile was right that the cake was simple, but it is simple in ways that I love. 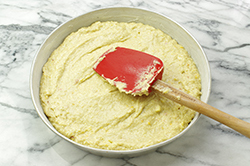 It’s simple to make – the batter comes together in less than 10 minutes. It has a simple look – you can dress it up if you’d like (see Bonne Idée), but I think it has great appeal left plain. Its texture is simple: soft and moist. And it tastes of simple ingredients: butter, sugar, flour and eggs – the baker’s quartet – and fresh oranges. Odile told me that she likes to really soak the cake with orange syrup when it comes out of the oven. My preference is to use only half the amount of syrup, but I leave it to you to decide. If you make it the way Odile does, it will be just what she said it should be: “humide, même mouille” (“moist, even wet”). A WORD ON TIMING: You should make the syrup as soon as the cake goes into the oven, so that the sugar has time to dissolve. 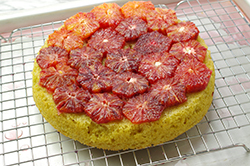 AND A WORD ON ORANGES: If you can find blood oranges, use them – they’re wonderful in this cake. TO MAKE THE CAKE: Center a rack in the oven and preheat the oven to 350 degrees F. Butter an 8-inch round cake pan, dust with flour and tap out the excess. 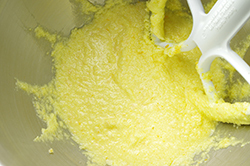 Put the sugar in the bowl of a stand mixer or in a large bowl in which you can use a hand mixer. Grate the zest of the orange over the sugar. Squeeze the juice into a measuring cup – you should have about 1/3 cup, but a little more or a tad less won’t throw things off. 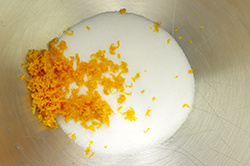 Rub the sugar and zest together with your fingertips until the sugar is moist and fragrant. If you’re using a stand mixer, fit it with the paddle attachment and attach the bowl. 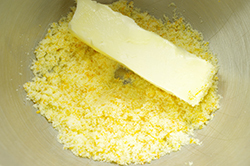 Add the butter to the bowl and beat on medium speed working with the stand mixer or hand mixer for about 2 minutes, until the mixture is smooth and creamy. 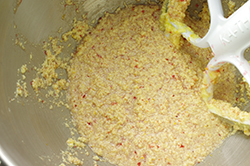 Add the eggs one at a time, beating for 1 minute after each one goes in, then pour in the juice and beat to blend. 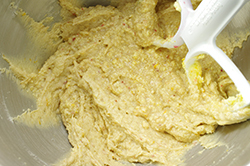 Reduce the mixer speed to low and add the dry ingredients, mixing only until they disappear into the batter. The batter may look a little lumpy and grainy, but that’s fine. Turn the batter out into the cake pan and smooth the top. 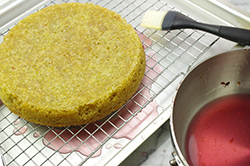 Bake the cake for 20 to 25 minutes, or until a knife inserted into the center comes out clean. 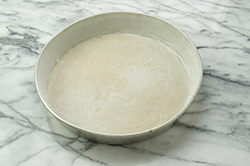 The top of the cake will be pale the bottom even paler As soon as you take the cake out of the oven, unmold it onto a cooling rack, invert it onto another rack and then put the rack over a baking sheet lined with plastic film or foil. 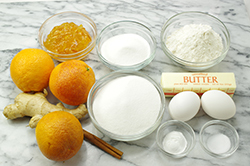 MEANWHILE, MAKE THE SYRUP: As soon as the cake goes into the oven, stir the sugar and orange juice together in a small bowl, and then stir a couple of times while the cake is baking. 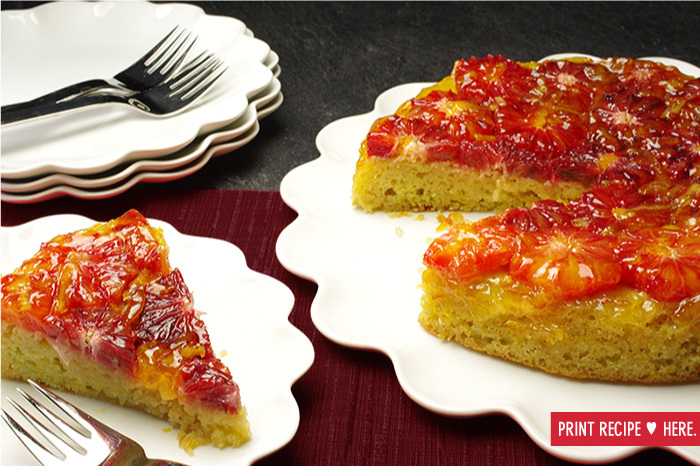 Don’t worry if the mixture is a little grainy – it will still soak into the cake nicely. Spoon or brush the syrup over the hot cake, working slowly so that it soaks into the cake. I usually use only half of the syrup – I like the cake moist but not wet – but you can use more if you want a thoroughly-soaked-through cake. 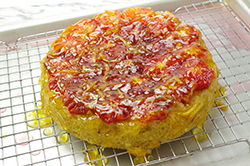 The cake is the same, but it’s topped with poached oranges and the poaching liquid becomes the soaking syrup. 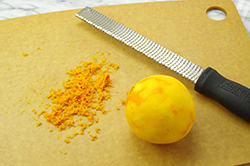 To make the decorative (and delicious) topping, you’ll need 3 additional oranges. Cut the tops and bottoms off each orange, stand the orange up and remove the remaining peel by cutting straight down the sides of the orange 5 times, to shape it into a pentagon. Then turn the oranges on their sides and slice them about 3/8 inch thick. 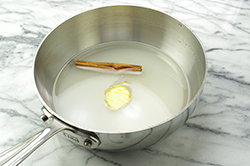 Bring 1 cup water, 1 cup sugar, 1 short cinnamon stick (optional) and 1 quarter-size piece fresh ginger (also optional) to a boil in a medium saucepan, then reduce the heat and simmer for 2 minutes. Gently drop the orange slices into the syrup and cook over low heat for 3 minutes. 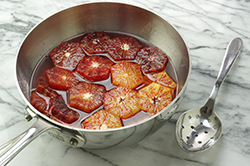 Carefully remove the slices with a slotted spoon; strain and reserve the syrup. Arrange the oranges on the top of the cake so that they fit together like a jigsaw puzzle, trimming the pieces around the edges of the cake with a knife if necessary. Pour about half of the warm poaching syrup over the cake. (Refrigerate the remaining syrup – it’s great in tea.) 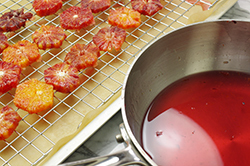 Then finish with a glaze: Melt some orange marmalade and brush it over the fruit. Cool the cake completely. 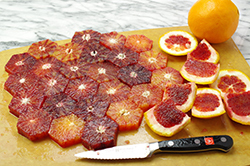 For a pretty, multicolored top, finish the cake with poached slices of blood oranges, navel oranges and ruby grapefruits. SERVING: There’s nothing to stop you from eating the cake the minute you’ve finished soaking it, but it benefits from a couple of hours’ rest. I think it’s even better the next day. STORING: Well covered, the cake will keep for up to 4 days at room temperature. Wrapped airtight, it can be frozen for up to 2 months. Defrost it in the wrapping.